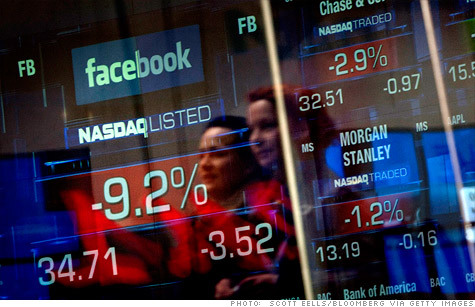 Facebook's IPO was a mess from day one, with Nasdaq delays and trading issues. Now shareholders are suing and the stock has plunged. NEW YORK (CNNMoney) -- Facebook's breathlessly hyped IPO on Friday has turned into a huge Wall Street debacle, with lots of confusion -- and now, lawsuits -- swirling around. Here's the still-developing blow-by-blow of how the biggest tech IPO in U.S. history became such a mess. What happened on Friday? The strangeness began at the most basic level: actually opening Facebook for trading on Friday. The regular U.S. stock markets trading day begins at 9:30 a.m, but IPOs listed on the Nasdaq exchange typically don't start trading until at least an hour later. Nasdaq told traders early Friday that it expected Facebook (FB) shares to begin trading at 11 a.m.
Then 11 a.m. came and went -- with no trading. The next half-hour was full of handwringing and confusion, until shares began trading around 11:30 a.m. Trading was fast and intense, with more than 80 million shares changing hands in the first 30 seconds. Soon, some traders began complaining that it didn't seem like their orders were being completed. Others found that they were getting shares at a higher price than they expected. The details were unclear on Friday, but on Monday, Nasdaq published a mea culpa explaining that the trading delay was due to a "technical error." That's a mild term for what became a huge issue. Following its usual procedures, Nasdaq started the process that should have led to the stock's first official trade at 11:05 a.m. Friday. In that process, Nasdaq matches up orders to buy shares with orders to sell. On Friday, the process fell into an unexpected loop because many traders submitted changes to their orders before the opening trade began. At 11:30, Nasdaq switched to another system, finally allowing the exchange to complete the process. Some orders that came in during the switchover didn't go through, or were filled at an inferior price later in the day. Also, many orders that went through weren't confirmed until hours later. That left investors unsure about how many shares they bought or sold, and at what price. The error's ripple effects have lasted for days. Some brokerages said late Tuesday that they still weren't sure if some of their orders had closed, or at what price. Five days later, Nasdaq is still trying to untangle all of the problems. Meanwhile, traders who took losses because of the error are waiting to hear what Nasdaq plans to do about compensating them. That's going to be another giant wrangle. So Nasdaq blew it. Why are shareholders suing Facebook? Totally separate from the Nasdaq issues, there's a regulatory investigation beginning into how Facebook and its bankers handled sensitive financial information. A group of Facebook shareholders filed a lawsuit in a New York district court on Wednesday, alleging that important information about Facebook's financial outlook was "selectively disclosed" to big banks ahead of the IPO. The legal action followed a Reuters report posted late Tuesday, which alleges that analysts at lead underwriter Morgan Stanley (MS, Fortune 500) received privileged information about Facebook's financials -- information that wasn't shared with regular folks. As a separate Reuters report noted a few hours later, Morgan Stanley and three other major underwriters -- Goldman Sachs (GS, Fortune 500), JPMorgan (JPM, Fortune 500) and Bank of America (BAC, Fortune 500) -- reduced their earnings outlooks for Facebook to strikingly similar levels ahead of the IPO. It's odd that four different banks would cut their estimates to similar sums in a short timeframe, and it raises the question of whether small shareholders were left out of back-door conversations. More specifically, the lawsuit alleges that Facebook told analysts at its underwriters "to materially lower their revenue forecasts for 2012." But it's still unclear whether those conversations actually happened -- and even if they did, were they illegal? That's a swampy gray area. Facebook released a statement on Wednesday saying the suit is "without merit," and Morgan Stanley says it followed "the same procedures for the Facebook offering that it follows for all IPOs." Why has the stock price fallen so much? Facebook's stock ended close to flat in its debut on Friday, and it touched the $38 IPO price many times during the day. It never fell below that level, leading market watchers to assume that the underwriters were buying shares to keep the price above water. Facebook closed at nearly $4 under that level on Monday, the stock's first full day of trading. The decline continued on Tuesday, though the stock was up modestly in midday trade Wednesday. That surprised many people: Recent tech IPOs have generally "popped" on day one -- even those of unprofitable companies like reviews site Yelp (YELP). Some market watchers are saying that Nasdaq's glitch and other technical trading issues are contributing to Facebook's stock plunge. "It's a day trader's paradise right now," Douglas DePietro, managing director for sales trading and trading execution at Evercore Partners, told CNNMoney. "There's high volatility and high volume." But Facebook's final IPO price, $38 a share, gave it a valuation in the ballpark of $100 billion -- a number that many analysts, ahead of the IPO, repeatedly warned was remarkably high given Facebook's financial fundamentals. All of the drama around Facebook's IPO may have some investors taking a very close look at the company -- and thinking twice about what its stock is really worth. --CNNMoney's Hibah Yousuf contributed to this report.